What does a model balloonist do, whose hobby is no doubt very much depending on the weather, when it's rainy and stormy for weeks and weeks? Finally, the solution to that problem was: Dustbin foil! As these balloons are very popular wherever we fly them, and also are quite suitable to start this hobby with, you can find some hints for do-it-yourself building here. The envelope is probably the most difficult thing about an indoor balloon, as far as you want it to look good. In fact, a turned-around dustbin bag would do as well, as long as it's light enough. Our indoor balloons all consist of dustbin or painting protection foil, which is welded together with a soldering iron. With a weight of only 7 g/m², the painting protection foil is probably the lightest material available to build balloons with. The coloured dustbin bags have an average weight of 15 g/m² and are therefore only suitable for a bit bigger balloons. As a burner, we use a tuned soldering torch or self-made constructions, depending from the size of the envelope. This one here was made out of a 'pencil torch solder' which can be found in every do-it-youself store. The spiral spring was only attached for design reasons. The burner frame was made out of aluminum sheet, it is mounted on four aluminum tubes which are glued to the bottom of the basket (wooden board). 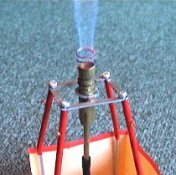 The burner is connected to a gas bottle with an adjustable valve by a long, thin plastic hose. Gas bottles with adjustable valves are available at home stores also. 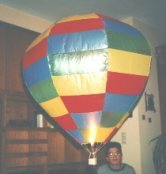 As any other indoor balloon equipment, the basket has to be as light as possible. 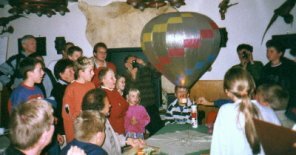 For the small indoor balloons, where you hold the burner in your hand, baskets are made out of paper or cardboard. This one comes from a paper kit. If the burner is mounted on the basked (see above), more solid materials have to be used, of course. However, the wall of the basked can always be made of paper or cardboard. Here you can see some of the envelopes which we built over the years. The most difficult and also last project was 'Herbert the rabbit' which was built after a little soft toy animal. 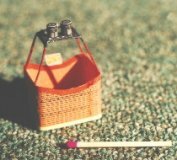 The little toy animal enjoys the view from the basket. You can see the pencil torch burner held in hand by the operator.